SIS LIVE: Outside Broadcast-uplink-transmission systems. Milton Keynes, UK 7th August 2012: Outside broadcast, uplink and systems integration specialists SIS LIVE has been working in a collaborative venture with France Televisions Sports Department to achieve a historic premiere in broadcasting, delivering the first ever live broadcasts from a mobile TV studio. Commissioned by France TV Sports, SIS LIVE’s British and French divisions have collaborated to design, construct and operate a live moving TV studio to deliver coverage of the London 2012 Olympics. Using state-of-the-art RF H264 technology and the expertise of SIS LIVE’s Comms specialists this vehicle is able to produce and transmit live TV while on the move, making dynamic use of 4 fixed receive high points around London which deliver RF coverage on selected routes around the city centre. This intelligent use of technology alleviates the need to employ a costly fixed wing aircraft relay solution, making this type of transmission a more viable prospect. The routes, which include Parliament Square, Hyde Park, Pall Mall, Piccadilly Circus, Embankment and the Tower of London, have been chosen to provide iconic London backdrops to the mobile bus broadcasts. Programmes and inserts from the bus are received by the SIS LIVE city-wide network and connected directly to France TV Sport’s London Olympic base for onward fibre transmission and subsequent broadcast on TV and online. Built into the body of a traditional red London bus, this mobile studio delivers a 50 minute live morning show each day featuring guests, panelists, live music from the likes of Katie Melua and Imani, as well as discussions concerning the French Olympic Team’s progress through the Games. It is also used to record clips which are periodically inserted live into the main programme throughout the day. 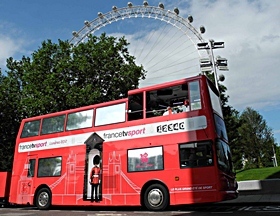 The bus itself, fast becoming the iconic representation of France TV in London, is featured heavily in the channel’s teasers and opening/closing credits, highlighting France TV Sport’s exclusive Olympic broadcasting within the country. The project involved the co-operation of a number of SIS LIVE’s departments based in Britain and France with technology installed at SIS LIVE’s facilities in Milton Keynes and Langley. The bus is operated by a crew of 10 people, supplied by SIS LIVE, and can accommodate up to 20 other personnel, including the director, talent and guests, with up to 8 people appearing onscreen simultaneously. The vehicle is equipped with 9 onboard HD cameras including 5 miniature remote controlled heads and a roving wireless camera transmitting via MPEG4 radio link. This project demonstrates the end-to-end service which SIS LIVE offers, including everything from system design, build and integration of technology, right through to operation of the finished studio and transmission of the final programme.